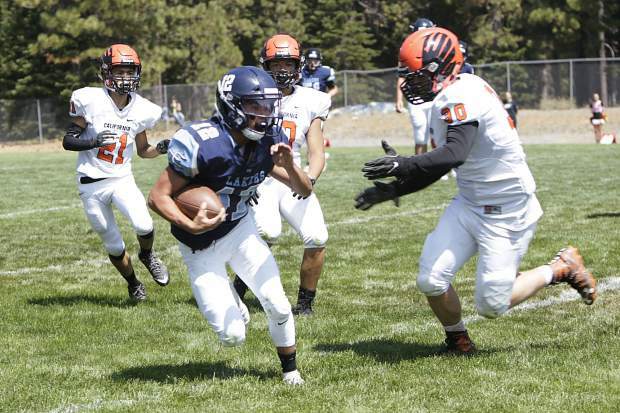 Quarterback Thomas Mercogliano looks to avoid the defense during North Tahoe’s season opener on Saturday. Rushing: T. Mercogliano 14-103, T. Frankenberg 10-55, E. Snyder 4-14, Ty. Frankenberg 3-10, B. Trujillo 1-2. Receiving: C. Kohnen 5-159-2, B. Trujillo 3-45-1, E. Snyder 3-8, T. Frankenberg 2-8. Frustration, missed tackles, and unforced errors underscored a tough opener for the North Tahoe football team as the Lakers fell 44-23 to California School for the Deaf. Eagles junior running back Calel Justice Olicia-Aramboles broke tackle after tackle on his way to 340 yards of total offense and four touchdowns. Olicia-Aramboles now has 11 touchdowns and after rushing for 265 yards against the Lakers, has nearly 700 yards on the ground through two games this season, said Eagles Coach Warren Keller. North Tahoe started the afternoon strong, taking an early lead when junior receiver Cooper Kohnen turned a short reception near midfield into a 54-yard touchdown. After giving up a touchdown and a two-point conversion to the Eagles, the Lakers evened the game at 8-8 on a bad punt snap that resulted in a safety. The teams then traded turnovers on the next four possessions, including an interception by senior Tony Frankenberg on fourth down and a forced fumble caused by senior Eli Snyder that set up a 26-yard field goal by freshman Justin Lopez. The 11-8 advantage was the last lead North Tahoe would hold as Olicia-Aramboles dominated. The junior back started by breaking multiple tackles on a 75-yard screen pass that went for a touchdown. On the next drive, Olicia-Aramboles broke through the Lakers’ defense on a 48-yard touchdown run and a 22-11 going into half. North Tahoe opened the second half with Kohnen snagging a 52-yard pass from senior Thomas Mercogliano, who capped the drive by finding sophomore Ben Trujillo for a touchdown. The score remained 22-17 after a failed two-point conversion. With North Tahoe making it a one-possession game, Olicia-Aramboles went back to work, first converting on a fourth-and-3 play, before again bouncing off several defenders on his way to a 22-yard touchdown run, and the two-point conversion, for a 30-17 lead. He blew the game open on the next drive, with a 75-yard touchdown run for a 38-17 lead. The Eagles scored again on a 46-yard pass by junior quarterback Miles Gonzalez. Kohnen added North Tahoe’s final points of the afternoon on a 36-yard reception with 3:17 remaining, capping off a stellar day for the junior receiver. Kohnen finished the game with a team-high 159 receiving yards. Mercogliano led Tahoe with 103 yards rushing and 220 yards passing. Senior linebackers Raul Estrada and Frankenberg led the team with eight tackles each. Senior captain Dalton Lamberth did not play due to injury. The Lakers will next hit the road to face off against their rivals from across the lake, Incline. The game is scheduled for a 7 p.m. kickoff on Friday, Aug. 31. North Tahoe took the win last year in dramatic fashion, scoring a late touchdown to defeat Incline. The Highlanders rolled to a 34-6 win last week over Valley Christian in their season opener. The contest also marks the Class 2A Northern League opener for both squads.